Country USA and Rock USA are music festivals promoted by our employer, Hypervibe, Inc. Country USA takes place on June 19 - 23, and Rock USA takes place on July 12 - 14, with some setup and tear-down work happening before and after those dates. As usual, the Business Agent will be contacting those he needs for these shows. The grounds for both Country USA and Rock USA is located south of Oshkosh, WI, on the west side of US Highway 41, more or less across from the EAA campgrounds. The audience enters the event grounds from the Hwy 41 side (the East side). 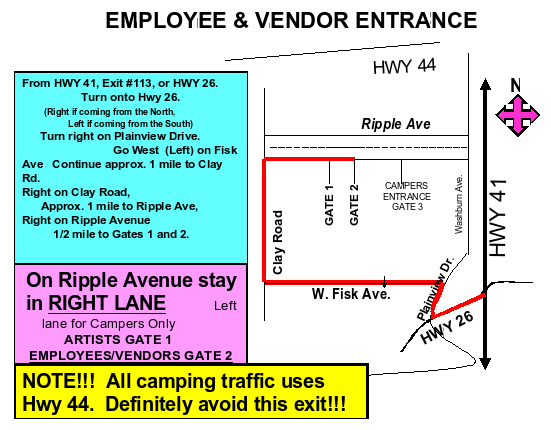 BUT if you are a stagehand, working the main stage with IATSE Local 470, then you will need to enter via the "stage door", which in this case means entering the grounds from the west, via Clay and Ripple Roads. Take Hwy 41 North or South to the Hwy 26 exit (Exit 113). Go West on Hwy 26 to the access road, and turn right onto Planeview Dr. Turn west onto Fisk Ave. Continue approx 1 mile to Clay Road. Turn right and go north 1 mile on Clay Rd. to Ripple Ave. From the intersection of Clay and Ripple Ave. you can probably see the Country USA grounds to your left about a third of a mile away. Turn right onto Ripple Ave. 1/2 mile to Gates 1 and 2. On Ripple Avenue stay in the RIGHT LANE. The Left lane is for Campers Only. ARTISTS use GATE 1, EMPLOYEES/VENDORS use GATE 2. Use Gate 1 onto the gravel road leading to the backstage areas. The Main Stage is located along the wooden fence on the west side of the grounds, directly opposite the headquarters building on the other side of the audience grounds. In general, try to get there early: fifteen to thirty min. is good. Traffic can be ridiculous, and sometimes is re-routed, so allow time for surprises. Police may re-route traffic patterns to handle the unusual loads, especially as showtime approaches. Heavy traffic means traffic jams. In the past, traffic later in the day can back up for HOURS! We still expect you to be ON TIME. Plan accordingly. If it seems you might be late despite all efforts, call the cell phone number for the Steward, which also means it makes sense to get the cell phone numbers BEFORE you leave home! You will be working outside most of the time. It can be hot, dry and dusty, or else cool and rainy, often in the same day. There is usually at least one severe storm sometime during the week. Hey, it's Wisconsin! Plan accordingly! Check weather in case raingear is in order (it's always in order). Bring a change of clothes and spare footwear for when you get wet. Bring shorts in case it gets hot, but also bring a warm jacket. It often gets quite cool after dark or after the rain. You feel it more when you are tired. Layers are good! It's a good idea to bring sunscreen and mosquito repellent! A hat is also a good idea. Bring the usual tools; gloves, a multi-tool or screwdriver and pliers, crescent wrench, hammer, and maybe other tools needed to get the job done. During stage setup and teardown a hard hat and hi-vis "safety" vests or shirts are required now, but hats and vests are usually provided if you do not have your own. Lunch is usually provided, as is water and sometimes soda. Lunch is about a half-hour long, taken in the catering tent. We don't have time to leave the site.